1. Preheat the oven to 200˚C, gas mark 6. Put the halved baby carrots in a roasting tray, drizzle with ½ tbsp olive oil, season and roast on the top shelf of the oven for 30 minutes. Meanwhile, cook the sliced carrots in a pan of simmering water for about 10 minutes or until tender, then drain. 2. Heat the butter and remaining 1 tbsp oil in a large casserole dish. When the butter has melted, add the onion and cook gently until softened – about 5 minutes. Add the rice and stir until coated and translucent in colour. Stir in the wine and bubble for a minute, then add the stock and bring to the boil. 3. Meanwhile, blend the drained, sliced carrot with a hand blender or in a small electric food processor until smooth. Stir the puréed carrot into the rice mixture and season. Cover the casserole dish and place in the oven, underneath the tray of baby carrots, for 20 minutes, or until the rice is tender. 4. 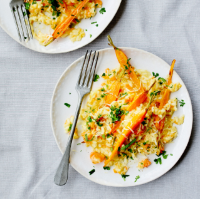 Uncover the casserole, stir through the grated cheddar and leave to stand for a few minutes before serving topped with the chopped parsley, roast baby carrots and some extra cheese, if liked.